The security and economic stability of many nations and multinational oil companies are highly dependent on the safe and uninterrupted operation of their oil, gas and chemical facilities. One of the most critical impacts that can occur to these operations are fires and explosions from accidental or political incidents. 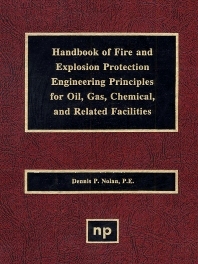 This publication is intended as a general engineering handbook and reference guideline for those personnel involved with fire and explosion protection aspects of critical hydrocarbon facilities. Design guidelines and specifications of major, small and independent oil companies as well as information from engineering firms and published industry references have been reviewed to assist in its preparation. Some of the latest published practices and research into fire and explosions have also been mentioned. Safety engineers, plants managers and hygiene personnel in the chemical and petrochemical industries.